Tuesday is Earth Day, an annual event started in 1970 to raise awareness of human effects on the air, land, water, other species, and ourselves. Environmental historian Adam Rome has chronicled the history of this celebration in his book The Genius of Earth Day. My research and teaching focus is the history of how humans have classified and handled wastes, and the consequences of those decisions. With that in mind, one way to observe Earth Day is to contemplate those consequences. A recent documentary provides useful global context. 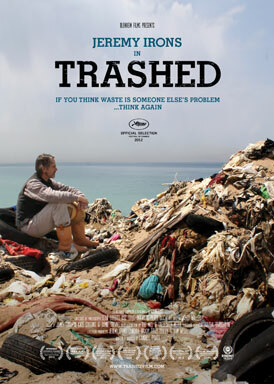 Trashed, narrated by Jeremy Irons, is a global look at how our creation of the waste stream — and especially plastics — has affected the land, air, and water. For scholars of waste, the film isn’t a huge revelation. Indeed, the summary I just gave sounds not all that far removed from the thesis of Joel Tarr’s 1996 book The Search for the Ultimate Sink. And we may quibble about various points in the film, from a simple look at recycling to a lack of discussion of cradle to cradle design solutions to minimize waste. Those, though, are quibbles about an otherwise impressive accomplishment. The film presents an accessible narrative of the real threats to human and environmental health from our out-of-sight, out-of-mind waste disposal patterns. It presents a conversation of how we can change our cultural patterns and infrastructure for more sustainable practices. It does so with production values and a celebrity narrator who have the potential to reach a far wider audience than most scholars do. As I mentioned to Mr. Irons, while I’m glad to have the Encyclopedia of Consumption and Waste: The Social Science of Garbage available to interested readers to learn more about the waste stream, this film will be seen by many more people than who will ever read it. Getting the general public aware of the consequences of waste is crucial to devoting the effort and resources necessary to create those more sustainable practices. You can see the film streaming over the net. Click the link at the previous sentence to watch. Sharing Trashed with casual fans of Jeremy Irons or Vangelis, or to friends and neighbors, is an excellent way to continue the inclusive spirit of Earth Day. Discussing our present concerns, future challenges, and future opportunities is utterly in keeping with the conversations women’s groups, college students, workers, scientists, suburbanites, Gaylord Nelson and all those who gathered 43 years ago did on the first Earth Day. See it online. Schedule a screening. But watch, and discuss it. This entry was posted in recycling, waste on April 20, 2014 by Carl Zimring.